The morning after we arrived in Iceland, we hit the road for our drive around Snæfellsnes Peninsula a little later than intended. We were exhausted, because we arrived in the middle of an Arctic storm and had to drive around 300km through it. But that’s a story for another day. 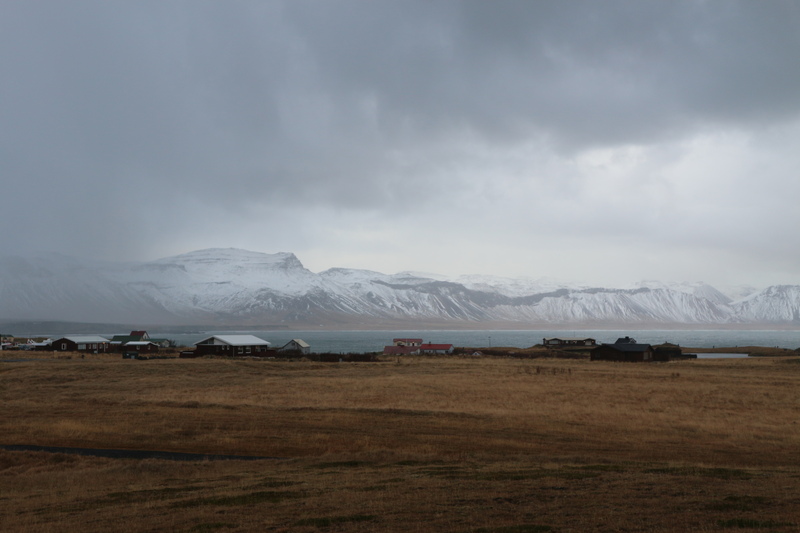 One of the stops we planned to make was at Arnarstapi, a little fishing village and old trading port. It’s an odd little place, full of contrasts – there are large area of flat, grassy land – then there are towering basalt columns and cliffs. Small, modest cottages dwarfed under mountains. 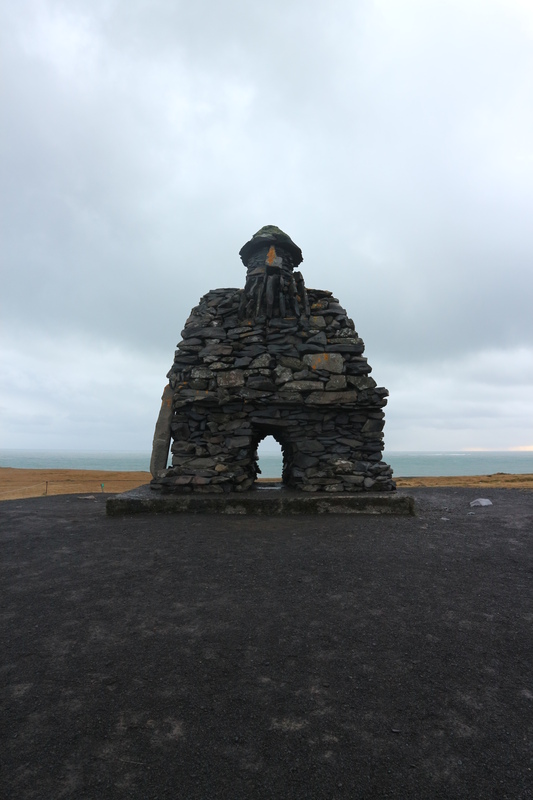 And then there’s the Bárður Snæfellsás sculpture that sits at the top of the hill against the grey sky. The imposing figure seen here was made in 1985 by the sculptor Ragnar Kjartansson. This work is Ragnar’s representation of the guardian spirit Bárður Snæfellsás, Deity of Mt. Snæfell. 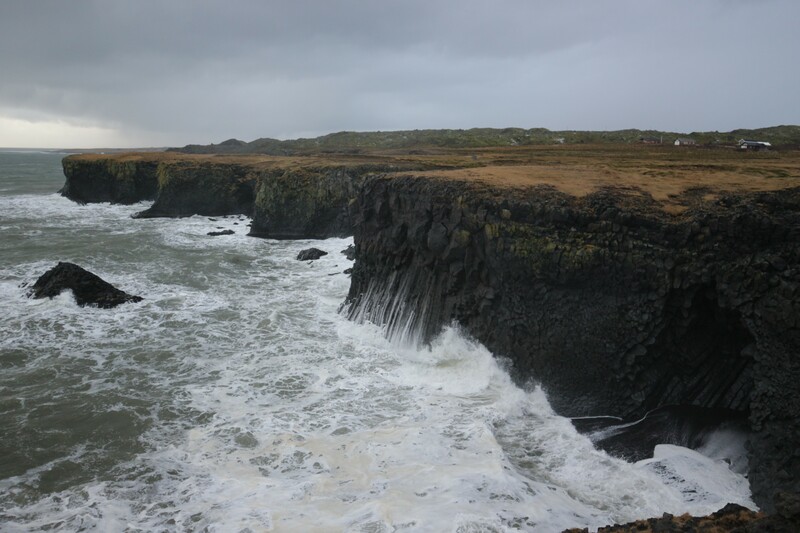 Bárður’s story is told in the saga of Bárður Snæfellsás. He was descended from giants and men. Bárður was the son of a king from Northern Hellaland in Scandinavia. He staked claim to the land of Laugabrekka by the Glacier at the end of the 9th century. Later in life Bárður’s giant nature became ever more apparent. In the end, he disappeared into Snæfell Glacier, but did not die. Bárður became a nature spirit and the local folk around the Glacier petitioned him in matters large and small. This work commemorates the couple Guðrún Sigurðardóttir (1878 – 1941) and Jón Sigurðsson (1876 – 1956), who lived here, and their son Trausti, who died of exposure on Jökulshals mountain pass in 1928, only 19 years of age.